TezBox with hardware wallet support provides you with the safest and easiest way to access and store your Tezos. Your private keys are kept extremely safe on your hardware device with a tamper-proof security module. TezBox is the first Tezos wallet to integate with Ledger, the first to integrate with Trezor, and the first (and currently only) to integrate with both. The benefits of using a hardware wallet are enourmous, and provides users with a high level of security and peace of mind. Coupled with the TezBox, you get a friendly interface and 100% secure crypto wallet for your precious Tezos. TezBox currently supports the Ledger Nano S and Trezor Model T. We hope to develop integrations with other hardware devices in the near future as well. 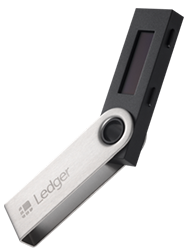 Get your hands on your very own hardware wallet today - choose an option above to buy direct from the official store. Note: these links provide TezBox with a referral kickback, which goes towards future development! You can support us AND keep your Tezos secure! © 2019 TezBox. All Rights Reserved.